Short lives, short size – why are pygmies small? For decades, anthropologists have debated over why pygmies have evolved to be short. Amid theories about their jungle homes and lack of food, new research suggests that we have been looking at the problem from the wrong angle. The diminutive stature of pygmies is not a direct adaptation to their environment, but the side-effect of an evolutionary push to start having children earlier. Andrea Migliano at the University of Cambridge suggests that pygmies have opted for a ‘live fast, die short’ strategy. Their short lives gives them very limited time as potential parents, and they have adapted by becoming sexually mature at a young age. That puts a brake on their pubescent growth spurts, leaving them with shorter adult heights. Immunity to viral infections sounds like a good thing, but it can come at a price. Millions of years ago, we evolved resistance to a virus that plagued other primates. Today, that virus is extinct, but our resistance to it may be making us more vulnerable to the present threat of HIV. Many extinct viruses are not completely gone. Some members of a group called retroviruses insinuated themselves into our DNA and became a part of our genetic code. Indeed, a large proportion of the genomes of all primates consists of the embedded remnants of ancient viruses. Looking at these remnants is like genetic archaeology, and it can tell us about infections both past and present. When retroviruses (such as HIV, right) infect a cell, they insert their own DNA into their host’s genome, using it as a base of operations. From there, the virus can pop out again and make new copies of itself, re-infect its host or move on to new cells. If it manages to infect an egg or sperm cell, the virus could pass onto the next generation. Hidden inside the embryo’s DNA, it becomes replicated trillions of times over and ends up in every single one of the new individual’s cells. These hitchhikers are called ‘endogenous retroviruses’. While they could pop out at any time, they quickly gain mutations in their DNA that knocks out their ability to infect. Unable to move on, they become as much a part of the host’s DNA as its own genes. In 2005, a group of scientists led by Evan Eichler compared endogenous retroviruses in different primates and found startling differences. In particular, chimps and gorillas have over a hundred copies of the virus PtERV1 (or Pan troglodytes endogenous retrovirus in full). Our DNA has none at all, and this is one of the largest differences between our genome and that of chimps. Our ancestors shared a similar geographical range to the ancestors of these apes, and would have encountered the same viruses, including PtERV1. And yet, we were spared from infection, while the apes were not. Why? Shari Kaiser and colleagues from the University of Washington and the Fred Hutchinson Cancer Research Center believed that the answer lies in a protein called TRIM5α that defends us from retroviruses. It latches onto the outer coat of incoming viruses, and tells other proteins to dismantle or destroy them. Other primates have their own versions of TRIM5α that protect against a different range of viruses, and the protein has evolved dramatically in different primate lineages. Kaiser believed that our version of TRIM5α protected us from PtERV1, while that of other apes did not. To test her idea, all she had to do was to resurrect a dead virus. Obviously, PtERV1 is long extinct, but its remnants exist inside the genomes of chimps. Kaiser compared dozens of these remnants and by identifying common elements, she worked out the ancestral sequence of the virus. She created a small part of PtERV1 and fused it with bits of a modern virus, MLV, to create a fully-functioning hybrid. To nullify any potential for spread beyond the lab, she crippled the virus so that it could infect once and only once. The reconstructed virus successfully infected mammal cells in a lab, but not when human TRIM5α was around. The guardian protein demolished the virus’s infectivity, reducing it by more than 100 times. As Kaiser predicted, our genomes are free of PtERV1 because TRIM5α killed it before it could reach our DNA. But this protection carries a price – it makes us vulnerable to HIV. Over the course of primate evolution, humans made an important change in the amino acid sequence of TRIM5α that allowed the protein to fight off PtERV1. When Kaiser changed the protein back to its original form, she found that it gained the ability to fight off HIV, but lost its resistance to PtERV1. In fact, Kaiser found that no primate species has a version of TRIM5α capable of fighting off both viruses at the same time. We are resistant to ptERV1 and vulnerable to HIV, but chimps, gorillas, baboons and rhesus macaques show the reverse strengths and weaknesses. When it comes to retrovirus immunity, there is no win-win situation. Having defeated one enemy, we have unwittingly made ourselves more vulnerable to another. Reference: Kaiser, Malik & Emerman. 2007. Restriction of an extinct retrovirus by the human TRIM5a antiviral protein. Science 316:1756 – 1758. A common theory of human evolution says that after our ancestors descended from the trees, they went form walking on four legs to two. But a new study in orang-utans could overturn that theory, by suggesting that our ancestors evolved a bipedal walk while they were still in the trees. Walking on two legs, or bipedalism, immediately sets us apart form other apes. It frees our arms for using tools and weapons and is a key part of our evolutionary success. Scientists have put forward a few theories to explain how our upright gait evolved, but the ‘savannah theory’ is by far the most prolific. It’s nicely illustrated by this misleading image that has become a mainstay of popular culture. It suggests that our ancestors went from four legs to two via the four-legged knuckle-walking gait of gorillas and chimps. Dwindling forests eventually pushed them from knuckle-walking to a full upright posture. This stance is more efficient over long distances and allowed our ancestors to travel across open savannahs. But this theory fails in the light of new fossils which push back the first appearance of bipedalism to a time before the forests thinned, and even before our ancestors split from those of chimpanzees. Very early hominins, including Lucy (Australopithecus afarensis) and Millennium Man (Orrorin) certainly ambled along on two legs, but they did so through woodland not plains. Our arms provide a further clue. Even though our ancestors’ back legs quickly picked up adaptations for bipedalism, they steadfastly kept long, grasping arms, an adaptation more suited to moving through branches. To Susannah Thorpe at the University of Birmingham, these are signs that bipedalism evolved while our ancestors were still living in trees. Two legs good, four legs bad? But there is a snag – an adaptation must provide some sort of benefit. And, as many children painfully discover, it is hard to imagine how walking on two legs could benefit sometime in a tree. But Thorpe has an answer to this too. She spent a year in the Sumatran jungle, studying the orang-utan – the only great ape to spend the majority of its life in the trees. She carefully documented over 3,000 sightings of wild orang-utans moving through the treetops. On large sturdy branches, they walk on all fours (below right), and on medium-sized ones, they start to use their arms to support their weight. But on the thinnest and most unstable branches, the apes use a posture that Thorpe calls ‘assisted bipedalism’ (below left). They grip multiple branches with their long, prehensile toes and use their arms to balance and transfer their weight. And unlike chimps which bend their knees while standing up, bipedal orang-utans keep their legs straight, just like humans do. It’s a win-win posture – the hands provide extra safety, while the two-legged stance frees at least one hand to grab food or extra support. With it, the apes can venture onto the furthest and thinnest branches, which provides them with several advantages. As Thorpe says, “Bipedalism is used to navigate the smallest branches where the tastiest fruits are, and also to reach further to help cross gaps between trees.” That saves them energy because they don’t have to circle around any gaps, and it saves their lives because they don’t have to descend to the ground. “The Sumatran tiger is down there licking its lips”, she said. With these strong adaptive benefits, it becomes reasonable to suggest that bipedalism evolved among the branches. 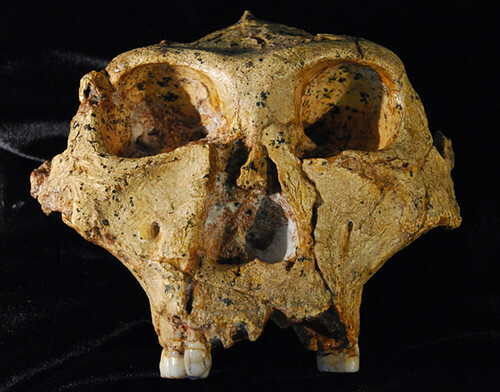 Based on this theory, Thorpe, along with Roger Holder and Robin Crompton from the University of Liverpool, have painted an intriguing new picture of ape evolution. It begins in the same way as many others – with the rainforests of the Miocene epoch (24 to 5 million years ago) becoming increasingly patchy. For tree-dwelling apes, the gaps in the canopy started becoming too big to cross. But in Thorpe’s view, these ancestral apes were already using a bipedal stance, and different groups took it in separate directions. The ancestors of orang-utans remained in the increasingly fragmented canopy and became specialised and restricted there. The ancestors of chimps and those of gorillas specialised in climbing up and down trees to make use of food both in the canopy and on the ground. The postures used in vertical climbing are actually very similar to those used in four-legged knuckle-walking and this became their walk of choice on the ground. The ancestors of humans abandoned the trees altogether. They used the bipedal stance that served them well on thin branches to exploit the potential of the stable land environment. Over time, they brought in further adaptations for efficient walking, culminating in the human walking style that we now neglect by sitting at a computer all day. Thorpe’s reconstruction is delightfully non-human-centric. It suggests that in the evolution of movement, we were conservatives who relied on a walk that had been around for millions of years. Chimps and gorillas with their fancy new knuckle-dragging gait were the true innovators. Reference: Thorpe, Holder & Crompton. 2007. Origin of human bipedalism as an adaptation for locomotion on flexible branches. Science 316: 1328-1331. Image: Black and white image from Science magazine. The human retina is back-to-front. Its silly structure means that light has to cross a tangle of nerves and blood vessels before it reaches the light sensors at the back. Now, scientists have found that the retina uses special cells called Muller cells that funnel light through the retina, in the style of living optic fibres. If you were a designer tasked with creating a machine for collecting and processing light, the last thing you would come up with is the human eye. Darwin marvelled at the eye’s perfection, but in this, he was wrong. Aside from the many illusions that can fool it, our eyes have a major structural flaw. In humans and other back-boned animals, the light-sensing cells of the eye lie at the back of the retina (see image right; courtesy of University of Michigan). In front of these sensors lie several layers of nerve cells that carry their signals, and blood vessels that supply them with nutrients. The nerves join to the main optic nerve which passes through a hole in the centre of the retina and connects to the brain. It’s a stupid, back-to-front design. Light has to pass through several layers of nerves, not to mention blood vessels, before it hits the retina itself. It’s a bit like designing a camera, and sticking the wiring in front of the lens. Octopuses and squid have a very similar eye to ours, but theirs’ are much more sensibly structured. Their nerves and blood vessels connect to the light sensors from behind so that light can hit the sensor cells without having to negotiate an obstacle course. And because their retina doesn’t need a hole to accommodate the optic nerve, they have no blind spot. In our own retinas, nerves and vessels are random in their spacing and irregular in their shape. The light that shines past them is reflected, scattered and refracted. It’s amazing that our eye can see at all. But even though there is clearly no designer, evolution does a pretty good job instead. It has a remarkable capacity for making the best of a bad job. In the case of our eye, some of the obscuring cells act as living optic fibres, to funnel light onto the sensors it covers. Kristian Franke and colleagues from the Paul Flechsig Institute for Brain Research first noticed these fibres by shining light onto the retinas of guinea pigs. They looked at a cross-section near where the light sensors lay and saw a very regular pattern of bright spots. Clearly, some parts of the retina were transmitting light far better than others. As they looked at further cross-sections throughout the retina, they realised that the bright spots were the endpoints of long tubes that stretched throughout the retina. Near the top, the tubes widened into funnels. Franze identified these tubes as Muller cells. The brain cells aren’t nerves themselves, but are part of their supporting cast. They are long cylinders arranged in columns across the entire retina, and provide a route for light to pass through the tangled morass of nerves and blood vessels. The Muller cells gather light at the top of the retina and channel it to the light sensors as a tight beam. Along the way, the light is barely reflected or scattered and little is lost when it finally reaches the light sensors, just like modern optic fibres. Light enters the Muller cells at a shallow angle and is slowed down considerably by the cells’ high refractive index. When it hits the cells’ boundaries, it is almost completely reflected back along the tube. Their funnel shape allows the Muller cells to gather and transmit as much light as possible. But as they narrow in the middle, they take up a very small amount of space and leave plenty of room for the blood vessels and nerves that the retina needs. On average, each Muller cell serves a single cone cell and several rod cells. This one-to-one system ensures that the images that eventually hit the light sensors keep strong contrast, and are not distorted. Evolution has given the vertebrate eye a remarkably ingenious solution to its ludicrous inverted retina. The eye may not be the perfect organ that Darwin thought, but new insights into its’ evolution still provides us with awe-inspiring surprises. Reference: Franze, Grosche, Skatchkov, Schinkinger, Foja, Schild, Uckermann, Travis, Reichenbach & Guck. 2007. Muller cells are living optical fibers in the vertebrate retina. PNAS 104: 8287-8292.